A state of being out of touch with reality and in this case with money in debt…. yep that’s living in a financial independence la la land. You dream of retiring and doing anything your heart desires because you were smart with your money when you were younger but were you really? You don’t have to be married or in a relationship either to be a donut with your money. I don’t normally watch too much television but last night for the very first time we watched Money Moron staring Canadian financial guru Gail Vaz Oxlade. You either love her or you hate her because of her no-nonsense to the point approach with personal finance. I happen to think if you beat around the bush with finances you get nowhere. Sometimes it’s hard to hear the truth but if that’s what it takes to wake someone up from a financial independence la la land then so be it. It’s amazing how many people who want to retire early and think that the road to that money independence is easy peasy when in fact it takes lots of work. There’s more to the fat bank account than having a shopping budget that will help you to the finish line before your peers. It’s about having your money saving money and thinking ahead while being realistic and enjoying life along the way. Wealth doesn’t happen overnight unless you are lucky, heck it’s taken me years upon years to get where I am and I’ve even made plenty of mistakes along the way. Although we watched plenty of her “Til Debt Do Us Part” show years ago this one was a bit different. To be honest I don’t know how she holds back because sometimes you simply want to toss a bucket of water in someone’s face to wake them up. I tend to finish her sentences when she bites her tongue but I’m pretty sure she’d have much more to say than I would. Problem is, she can’t fix the way someone is they need to figure it out on their own. Gail or anyone who is a financial nerd can hand someone all the financial tools they need but if they aren’t willing to change they just collect dust. It’s with anyone really, you can’t pour your financial habits on to them and expect them to be the same. It doesn’t work that way. All you can do is examine their habits if that’s what they want and make suggestions. There’s lots of pride shining on that show especially when it comes to the man not bringing in enough money to support a family and he refuses to do anything about it or he sulks and says the world owes him not the other way around. Sorry buddy, life doesn’t work that way. Same goes for the ladies, if you want to be a stay at home mom you either need to have that supporting income and budget that fits or you simply can’t do it so don’t try to make the financial puzzle work when you can’t. You need to make changes before so don’t whine about going into debt when you knew from the start you couldn’t afford it. I have people searching every day on my blog about how they can afford to even go on maternity leave let alone be a stay at home mom. It’s tough in Canada these days so you better know your finances inside and out and not make excuses about how much you owe and spend it will only bite you in the backside in the end. The reality is most people don’t hear how silly they sound when they talk about their finances and how they view debt. I’m not just talking about people who are in debt up to their eyeballs but even those who earn lots of money but spend it just as fast. That I am entitled talk really gets old. Some people you can talk to them until they are blue in the face about getting their finances under control but it’s like talking to a goat who can only say Baaaaaaaa… as if there was no way in the world they could consider using a budget or simply monitoring their finances. It’s like the good old saying “in one ear out the other” or not believing in themselves so they give up before they begin. The one guy in the episode we watched spent more time feeding and walking his dogs each week than he did with his own child and working. He felt working 22 hours a week was enough to have his wife become a stay at home mom and sustain the family home. Knock, Knock… McFly are you in there? Anyone who watched that episode couldn’t understand why on earth she was with him. I did feel sorry for her especially after some of the things he said. She left him for a moment at the end of the show but got back with him and lost her $3000 cheque that Gail was to give her. I’d be shocked to see that relationship last unless he changes but some people put up with crap just to keep a family together. Funny thing is, it never works and eventually you have a decision to make. Some of the things he said on the show made me shake my head. I agree with Gail not giving it to her and they have a long road ahead if they didn’t learn anything from being on that show. To be honest some people simply don’t know and that’s why they end up on Gail’s show not only because they think they will get the money from her but maybe she’s right. Well I’m pretty sure she’s certainly not hurting for cash and she knows what she’s talking about. Generally you can tell the people who are on the show to seriously make a difference in their personal finances and the others who think ah heck so what if the world knows we just want Gail’s money. She knows too and that’s why when you see people not get the full amount it’s because their heart wasn’t there from the beginning. I’m sure Gail will agree that what she teaches is not rocket science and it’s a pity that finance is not taught in the education system. Maybe that would help people gain a better understanding about the simple fact of “spending more than you earn” means you will end up in debt if you can’t pay it all back in full. Rocket science, not really its simple math which if I recall was my favourite subject in high school but that doesn’t necessarily mean that one will understand how to apply that math to their finances with lessons. The second episode I watched tonight showed the husband boasting about his $90,000 income and felt that he could do whatever he wanted with that money. He has a wife and a child on the way. What he failed to come forward with was that it was his gross salary not his net. For some reason I honestly don’t think he had a blinkin clue. He net $43,000 after expenses and taxes plus her $24,000 income ( I believe that was the amount) didn’t quite add up to enough to pay for their $12,000 in expenses they were spending monthly when Gail did a clean-up of their bank account. I bet that really opened his eyes. If there is one thing you must remember it’s that just because you earn a certain amount every year if it’s not what you bring home and is in your bank account it’s not your net income. It’s all fine and dandy thinking you make almost 6 figures and you want to fit the role but you don’t look as appealing when you’re sinking in debt. Think net as in catching fish to take home for dinner, that is your gold. He quickly changed his tune once Gail gave them the challenges and their marriage was saved. It’s amazing how so many couples will push themselves to the limits of potential divorce over money when the solution is simply working together and being realistic with their budget. That’s living in a financial independence la la land and I truly hope these people wake up before it’s too late. If you think you are struggling while you are both earning an income you have another thing coming when you get divorced, especially if kids are involved. One thing Gail suggested was opening multiple savings accounts so you don’t spend the money you save. Even better is putting money in a bank that offers little to no fees like President’s Choice Financial. Fees alone for some people are mind-blowing and could feed a family of 6 worth of groceries for a month with what they pay in service fees. 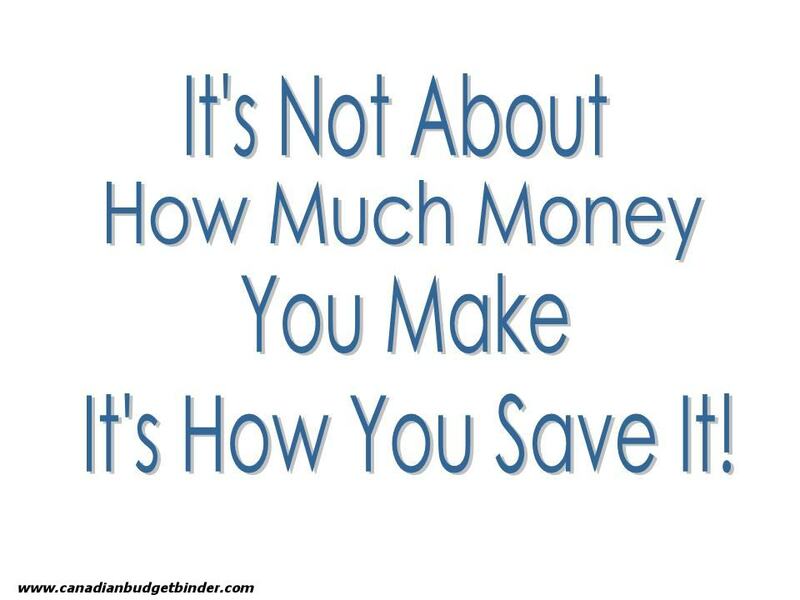 People who are not disciplined spend extra money they earn or save in the bank all the time. They get a bonus or they save money and put it in their bank account and before you know it they are making excuses for why they have to spend it. This is why we went ahead and opened several savings accounts. There’s only one account that is used to spend money. Our projected expenses account holds all the money we know we will have to pay at some point during the year. We never use that money for anything but those expenses. It’s hard to track those expenses if you keep all that money in one pot. When you start a family and think that you can continue doing what you have done financially if you are in debt you’ve got another thing coming. Carrying your weight as a mom and dad when you have a child on the way is imperative. You can’t live life according to what you want to do and because you can’t get a certain job you simply don’t work or only work a few hours a week. Time to grow up. Once you involve children and if you are in good health you must do whatever it takes to contribute to a relationship financially because now you have a child to consider. Separate bank accounts? I won’t judge you if you are married and have separate accounts and you both pay a portion of the bills but I’ll be honest and say I don’t understand it. I’m sure you have your own reasons about why but if I can’t trust my spouse financially, I won’t be marrying that person. What’s the difference it’s not your money it’s our money as it should go in one big pot. That just instigates more ways for your partner to potentially spend more money without you knowing and hiding it. I won’t get into a big debate on this one because to each their own, I just never thought of anything separate when I got married. Some couples feel that just because one partner makes more money they have the right to spend more money. Boy, are they going to have a rude awakening one day. Money truly is a mystery to many people and to be honest, it’s pretty simple. The problem is unless you are taught from a young age or simply ‘get it’ then you might have to learn the hard way and I don’t mean struggling to make ends meet I mean budgeting your money to make it work. There’s no easy fix and the money you get for going on Gail’s show isn’t going to solve your money problems it’s simply a little help if you deserve it. Living in a financial independence la la land is only going to hurt you down the road so buckle up if you aren’t willing to wake up and make some changes to your finances. No one else will give a rats if you don’t. Do you know anyone who live in a financial independence la la land? Canada is in a pretty good economic place at the moment. USA is having trouble controlling their debt.Europe is sliding further and further into a Depression, and now Australia is experiencing a lot of large companies closing up and I think it really is only a matter of time, before we feel it here. Sometimes I think it may be the best thing that could happen. I know that sounds weird. We have generations who have never had a problem getting credit, welfare or really taking any responsibilities for any of the decisions they make. Maybe if credit wasn’t so readily available, and people actually needed to live on cash/ debit, everyone would be better off. I understand what you are saying about having that available credit and not knowing how hard they will be hit if we are hit and it’s darn well possible. Couldn’t agree more!!! 🙂 I know several people in financial la la land! I definitely know some people in financial la la land! I’ve been there to a lesser degree myself. Becoming debt free, retiring early, and being “rich” doesn’t happen overnight. It takes work! Hard work! Some people really just don’t think about money and it amazes me that they can just get by. But that’s the thing, they are just getting by. I want more security, happiness and strength. There are so many valid points in here… Our chequing account is joint but the savings account that is our emergency fund is in my name only. Given how fast the money hubby inherited when his mom died and the house was sold disappeared, the bequest my Mom left me went into my name. It wasn’t much, but I’m trying to hang onto it as much as I can. It was used to pay off the truck and then it was set up that money rolled overto pay me back every week.after hubby fell off the roof that amount was lowered but a small amount still rolls over. It’s the only way the money gets saved. For a couple to save and have a budget work takes both people together. Some let pride or an overinflated opinion of themselves stand in the way of working together…. Great post, Mr. CBB. We are in absolute accord. I meet with a lot of people who assume I have some magic wand and can not only make their debt disappear but miracuously make money appear too. I wish I had that magic wand but even then people in that mindset wouldn’t appreciate it anyway. “Gail or anyone who is a financial nerd can hand someone all the financial tools they need but if they aren’t willing to change they just collect dust.” So true! I know people want the easiest and least painful method to get out debt, earn more money, etc. but aren’t willing do the work or change habits. That was what I noticed with the one gentleman in the show because he had no motivation to work more hours or earn more money. It was sad how he put his dogs first over his wife and child.